FM19 real names fix. Fix fake name of competitions, clubs and awards with their real names in Football Manager 2019. Fix works with your current saves. 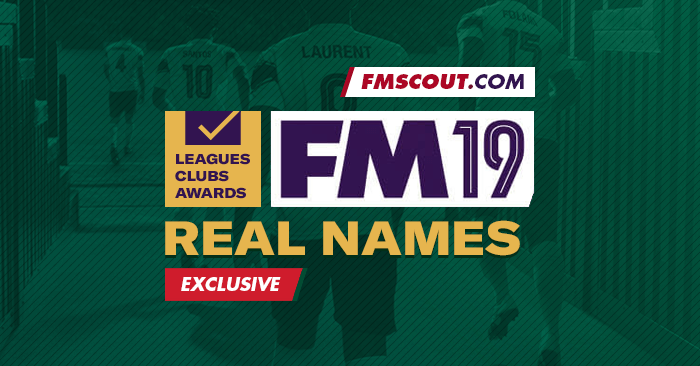 Welcome to Real Names License Fix for Football Manager 2019 by FM Scout. You don’t have to start a new save for this to work, except for Brazilian clubs. If you find errors in translation / names or need a fix for other club / league / competition names, please post a comment below and I’ll try my best to update these files. Quit the game (if it’s open). Extract the contents of the pack you downloaded from here to a temporary location. You’ll need them for step 6. Open the lnc folder and then enter the all sub-folder. Move Carlos FM19 Fix.lnc and Carlos FM19 Club Names.lnc inside this all folder. Go 2 folders back to find the edt folder. Open it and then enter the permanent sub-folder. This will fix Danny Blind from getting renamed to Jan Jansen. Again go 2 folders back, this time to find the dbc folder. This will prevent Brazilian clubs from reverting to 3-letter names and will allow certain kits to be visible again. Open the game and enjoy Football Manager 2019 with real names. Brazilian clubs have three-letter names in my game. How to fix? Even though Brazilian club names are fixed in our files, the game will continue to show the 3-letter name instead of the full name. That is due to certain dbc files that affect them when you save your game for the first time. You need to start a new save AFTER applying this fix (in full), for Brazilian team names to be correct. I applied the fix, but I’m still seeing some wrong club names. During career game set up, you will still see incorrect names for three Spanish clubs, but once you select your club and start playing, the names will be correct. Don’t like a name? Change it! Open the fix file in a text editor such as Notepad, search for the name you want to change, change it, and save. It’s really that simple. The fix will apply the next time you start FM19. Copy the following path and paste it into the “Go to Folder” input field. Finally click “Go” to go to the folder.